As any member of my family can attest, I love ice cream. Any day, any season, no matter the weather. Y’all may be drinking coffee and eating candy canes but I guarantee I’m eating ice cream! I truly believe if I could give up my nightly ice cream snack I would lose weight. Alas, I haven’t figured out a way to expunge it from my diet and you won’t either after you see how easy this treat is. 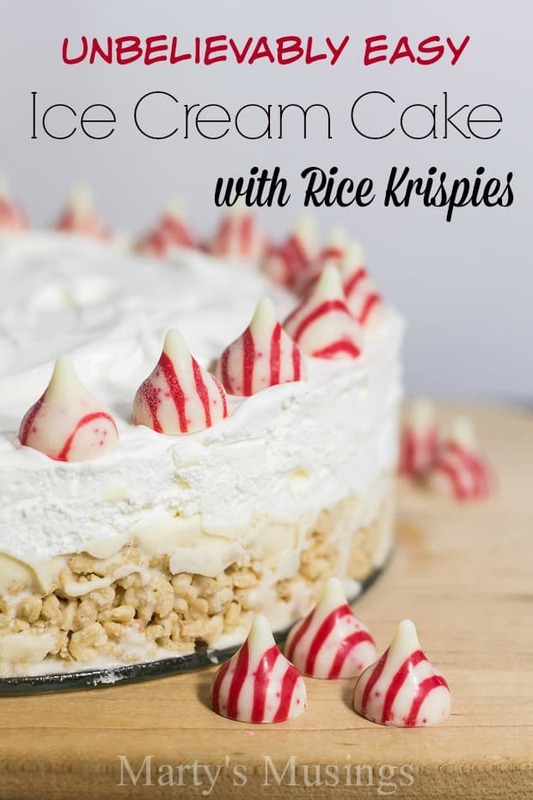 When I saw this beautiful ice cream cake I knew my hubby would love it since he’s a huge fan of rice krispies treats. This is a terrific recipe with easy ingredients to keep on hand. Allow ice cream and whipped topping to soften. Use a bit of oil to grease the bottom of the springform pan (or you could even use a 9×13 dish). Melt chocolate on low heat in short intervals to keep from burning. Mix the chocolate and cereal together completely. Put a little bit of oil on your fingers to help press the crust down firmly in place. Huge selling point for this recipe? You can customize it to your own personal tastes. Have a kid who loves chocolate ice cream? Give them their favorite and decorate the cake with mini chocolate chips. Does your spouse only like peppermint ice cream? 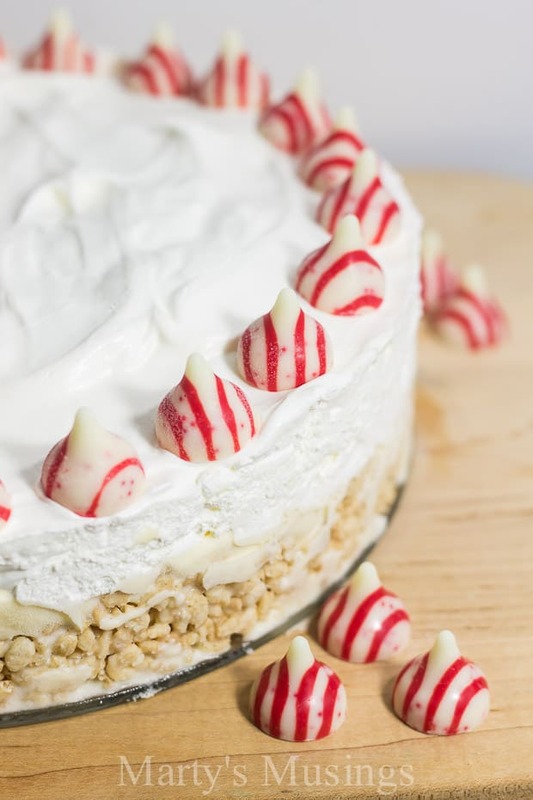 Buy an extra gallon at Christmas and crumble peppermint candies on the top. 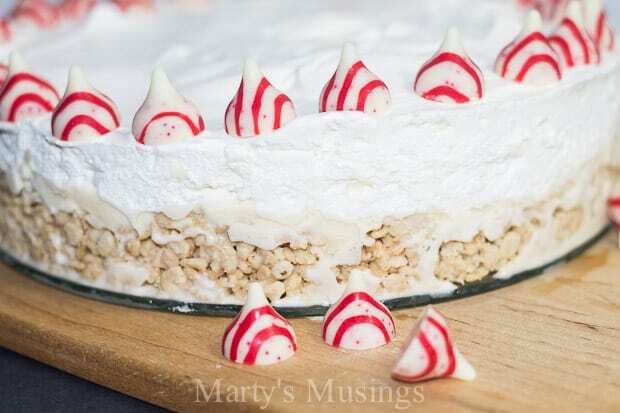 Use colored candy melts from a craft store and color the rice krispies to match each holiday. 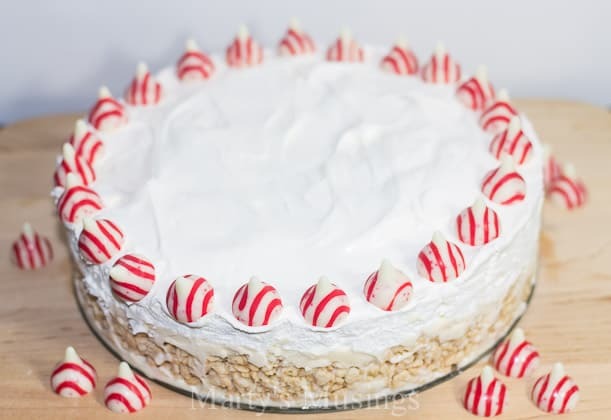 What else can you make with rice krispies? Check out #YahooDIY for 15 yummy recipe ideas! 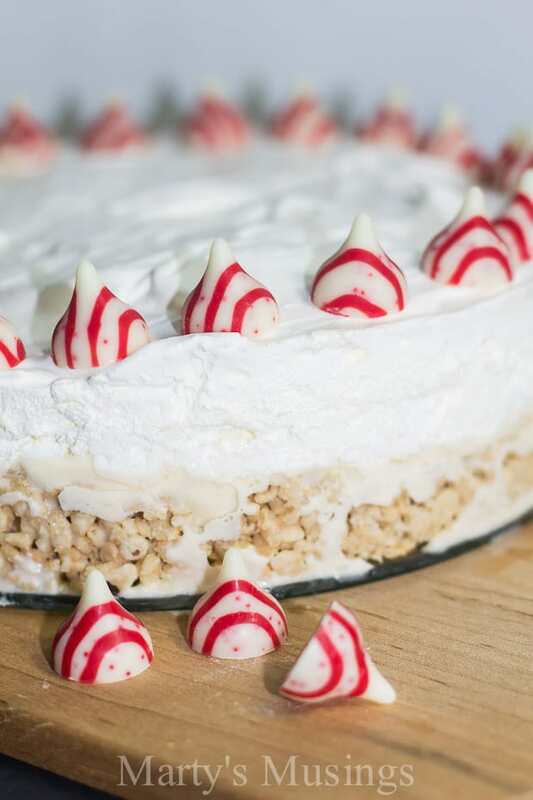 This easy ice cream cake begins with a rice krispies base and is topped with kisses! Melt white chocolate in microwave safe bowl in short intervals until melted. 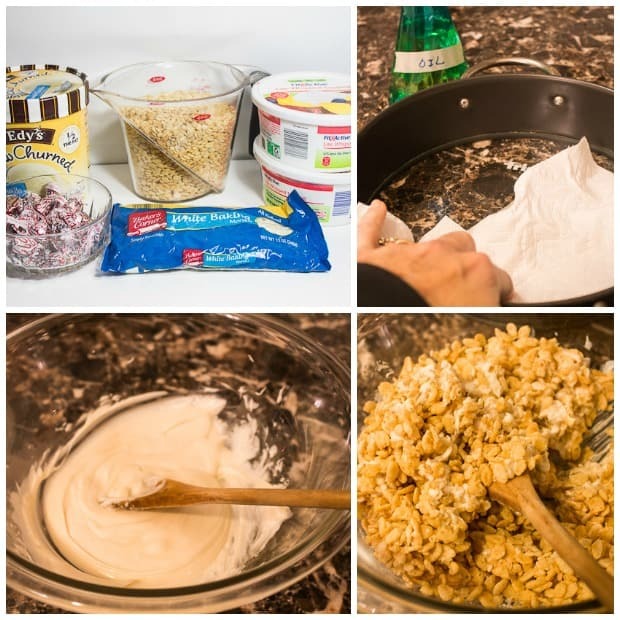 Stir in rice krispies cereal, coating the cereal completely. Press mixture into the bottom of a 9" or 10" springform pan. 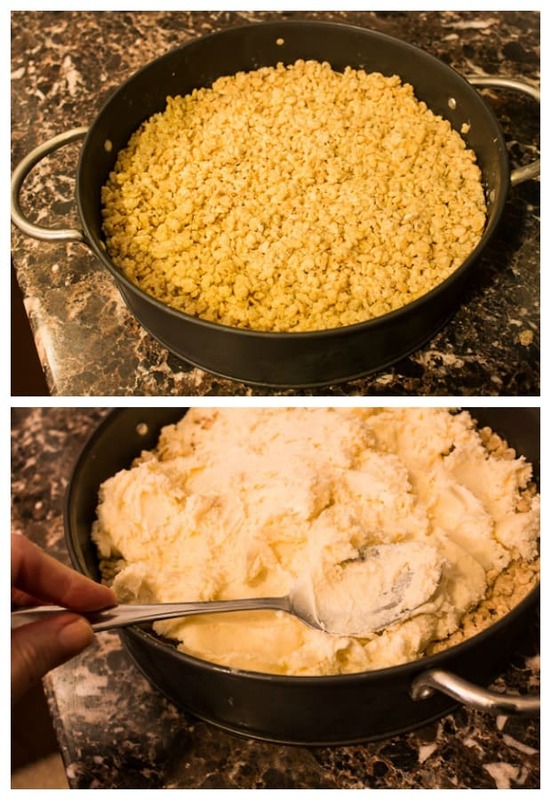 Freeze crust for 15 minutes. Remove from freezer and spread the ice cream on top. Top with whipped topping and chocolate kisses. Cover and freeze at least two hours. When ready to serve, allow to sit out for 15 minutes to make it easier to cut into slices. You can use any flavor of ice cream and topping. Try chocolate chips or other crushed candies. Also could be made in a 9x13 pan. Disclosure: Thank you Yahoo! for sponsoring this post. While this was a sponsored opportunity from Yahoo!, all content and opinions expressed are my own. Marty this looks yummy and not to hard. I need to try this ASAP. I hope you and your family have a wonderful Christmas and New Year. Merry Christmas to you and your family, Diana! Hi, Veronica. It’s whipped topping, like Cool Whip. Two 8 ounce cartons. Enjoy! This looks delicious. I love Christmas and I love ice cream cake. My birthday is 8 days before Christmas so this would be perfect and easy to make. Hi, Judith. I have two kids with December birthdays, the 12th and the 26th and now a grandson on the 17th. It’s a busy month and this ice cream cake is perfect. Enjoy! This looks amazing! Tasty and cute! I can’t wait for Christmas! This will be on my list to make! Thanks, Jennie. We really love the blend of Rice Krispies and ice cream!